Production: Franz Seitz Filmproduktion, Bioskop Film, GGB 14 KG, Artemis Filmegesellschaft, Argos Films, Jadran Film, Film Polski; Eastmancolour, 35mm; running time: 142 minutes. Filmed in Zagreb, Munchen, and Paris, 1978. Producer: Franz Seitz; executive producer: Anatole Dauman; screenplay: Jean-Claude Carrière, Franz Seitz, and Volker Schlondorff, with the collaboration of Günter Grass, from his original novel; photography: Igor Luther; editor: Suzanne Baron; assistant directors: Branko Lustig, Alexander von Richtofen, Wolfgang Kroke, Andrzej Reiter, and Richard Malbequi; lighting: Karl Dillitzer; production design: Nikos Perakis; art director: Bernd Lepel; sets: Paul Weber, Edouard Pezzoli, Marijan, and Marcijus; music: Maurice Jarre; costumes: Dagmar Niefind, Inge Heer, and Vashy Yabara; sound recording: Walter Grundauer, Walter Kellerhaus, and Peter Beil. Cast: David Bennent ( Oskar Matzerath ); Mario Adorf ( Alfred Matzerath ); Angela Winkler ( Agnes Matzerath ); Daniel Olbrychski ( Jan Bronski ); Katharina Thalbach ( Maria Matzerath ); Heinz Bennent ( Greff ); Andrea Ferreol ( Lina Greff ); Fritz Hakl ( Bebra ); Mariella Oliveri ( Roswitha Raguna ); Tina Engel ( Anna Koljaiczek ); Berta Drews ( Anna Koljaiczek, as an old woman ); Roland Teubner ( Joseph Koljaiczek ); Tadeusz Kunikowski ( Uncle Vinzenz ); Ernst Jacobi ( Gauletier Lobsack ); Werner Rehm ( Scheffler ); Ilse Page ( Gretchen Scheffler ); Kate Jaenicke ( Mother Truczinski ); Helmuth Brasch ( Old Heilandt ); Wigand Witting ( Herbert Truczinski ); Marek Walczewski ( Schugger-Leo ); Charles Aznavour ( Sigismund Markus ). Awards: Palme D'Or, Cannes Film Festival, 1979; Oscar for Best Foreign Language Film, 1980. Sclondorff, Volker, and Günter Grass, Die Blechtrommel als Film , Frankfurt, 1979. Lewandowski, Reiner, Die Filme von Volker Schlondorff , Hildesheim, 1981. Phillips, Klaus, editor, New German Filmmakers: From Oberhausen through the 1970s , New York, 1984. Elsaesser, Thomas, New German Cinema: A History , London 1989. Ginsberg, Terri, Perspectives on German Cinema , New York, 1996. Elsaesser, Thomas, The BFI Companion to German Cinema , Bloomington, 1999. Bonneville, L., Séquences (Montreal), January 1979. Variety (New York), 16 May 1979. Bassan, R., Ecran (Courbevoie), July 1979. Logette, L., Jeune Cinéma (Paris), July-August 1979. Ramasse, F., Positif (Paris), July-August 1979. Courant, G., Cinéma (Paris), September 1979. Lajeunesse, J., Image et Son (Paris), September 1979. Schlondorff, Volker, "Confrence de presse," in Jeune Cinéma (Paris), September-October 1979. Bonnet, J.-C., and F. Cuel, Cinématographe (Paris), October 1979. Lardeau, Y., Cahiers du Cinéma (Paris), November 1979. Jeancolas, J.-P., "Trois Notes (Brèves)," in Positif (Paris), November 1979. Kauffmann, Stanley, "Living through Wars," in The New Republic , 5 April 1980. Boyum, Joy Gould, "Günter Grass on Screen: An Allegory of Nazism," in The Wall Street Journal , 11 April 1980. Hatch, Robert, "The Tin Drum," in The Nation , 19 April 1980. Kroll, Jack, "Bang the Drum Loudly," in Newsweek , 21 April 1980. Schickel, Richard, "Dream Work," in Time , 28 April 1980. Harvey, Stephen, "The Beat of a Difficult Drummer," in Saturday Review , May 1980. Blake, Richard A., "Danzig in the Dark," in America , 3 May 1980. O'Toole, Lawrence, "One Oskar Tailor—Made to Win Another," Maclean's , 5 May 1980. Simon, John, "Interior Exiles," in National Review , 30 May 1980. Dawason, J., Monthly Film Bulletin (London), June 1980. Reed, Rex, "The Tin Drum," in Vogue , June 1980. Kephart, E., Films in Review (New York), June-July 1980. "The Tin Drum," in USA Today , July 1980. Beaulieu, J., Séquences (Montreal), July 1980. Pachter, H., Cineaste (New York), autumn 1980. Hughes, J., "Volker Schlondorff's Dream of Childhood," in Film Quarterly (Berkeley), spring 1981. Kaes, Anton, Hitler to Heimat: The Return of History as Film , Harvard University Press, Cambridge, 1989. Hall, Conrad, "A Different Drummer: The Tin Drum , Film and Novel," in Literature/Film Quarterly (Salisbury), October 1990. Krzeminski, A., in Kino (Warsaw), November 1992. Silberman, Marc, German Cinema: Texts in Context , Wayne State University Press, Detroit, 1995. Feingold, M., "A Different Drummer," in Village Voice (New York), 12 August 1997. Volker Schlodorff's The Tin Drum is representative of the New German cinema, a period in the 1970s and 1980s dominated by a generation of directors who were children during and following the Third Reich. These directors have taken a retrospective look at their childhoods and their nation's history to examine the emotional wounds and sensitivities of the present. Marc Silberman in German Cinema states that the films of this period "critically refigure seductive images and sounds from Germany's fascist past in order to challenge the heritage of the Nazi cinema, and for the first time since the international successes of the early Weimar cinema, German films enjoyed once again critical acclaim beyond their domestic audience." The movie based on Günter Grass' powerful novel about Oskar, a boy growing up in Danzig between the wars, who is so horrified by the world that he wills himself to remain little. Like the novel, The Tin Drum traces the warped history of Oskar's family, beginning with his grandparents, peasants of the Polish countryside. In the first scene, a man chased by the police begs a woman to hide him. She lifts her skirts and he crawls to safe seclusion. When the police have gone he emerges, hurriedly closing the front of his pants, and in the next scene, the couple has a small child, Oskar's mother. The image of hiding under a woman's skirts for safety is repeated throughout the film, and is both a suggestion of safety and sexuality, as Oskar climbs under the skirts of his grandmother, into bed with a neighbor woman for warmth, and into bed with his housekeeper where he presumably fathers her child. The macabre notion of sexuality becomes a precarious site for comfort and safety, providing immediacy and accessibility, but is eventually spoiled by the excessive need with which it is sought. It may be a continuous reference to Oskar's wish at birth to return to the womb, but decides to stay in the world when his mother promises him a tin drum on his third birthday. Oskar Matzerath is played by 12-year-old David Bennent, who throws himself down a flight of stairs on his third birthday, celebrated by raucous adults with drink and debauchery, to prevent himself from growing up to participate in the obscenity of adult middle-class existence. He opts for perpetual childhood before the Nazis come to power and take over Danzig, his home town. The child, a symbol of protest, recognizes that Nazism is merely an extension of the world he has already rejected. 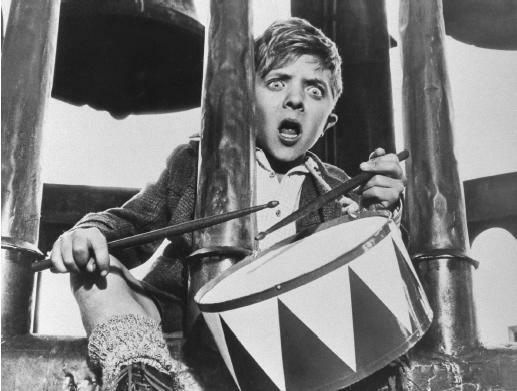 His life centers on his tin drum, and everywhere he wanders throughout the film he accompanies his steps with the stoic beat that could be the suppressed, frantic beat of his heart, his voice audible, yet untranslatable. Oskar is a perfect parody of militarism. He wanders into a Nazi rally, and the assembly soon collapses into chaos when his drumbeat sets the entire pageant off course. His other talent, piercing screams, which he discovers can shatter glass, are his willful destruction of that which inhibits or frustrates him. This voice is his defense, his weapon, screams an extradiegetic foreshadowing of Kristallnacht. When the war comes to Danzig, Oskar is there among the dead and wounded, wandering and observing. He is fifteen, but also three, and takes from the world what would please him, as though he has become that which he rejected when he decided to throw himself down the stairs to protect himself in the masquerade of childhood. The images in The Tin Drum are exceedingly unpalatable on screen though they were included in Grass' novel. Oskar, whose weakness is sensed by the other children, is forced to eat soup made of boiled frogs and urine. The decomposing head of a horse is pulled from the sea and a mass of eels tumbles out of it. Later, the eeler (Oskar's father) tries to force his wife, who was sickened by the sight, to eat his catch. She flees to her bedroom where she is consoled sexually by her lover, her husband's closest friend. Later in the film she becomes obsessed with a craving for fish until her gluttony destroys her. The image of the child banging on the door behind which his mother is dying, foundering on raw fish, will be repeated in another New German film, Deutschland, Bleiche Mutter ( Germany, Pale Mother ) by Helma Sanders-Brahms, though Oskar's mother never opens the door to return a sense of safety or reassurance to him or to the film, as the mother in Sanders-Brahm's film eventually does. Joy Gould Boyum writes in "Günter Grass on Screen: An Allegory of Nazism," in The Wall Street Journal , that these images, "enlarged, intensified and made overwhelmingly graphic by the movie screen . . . disturb too much instead of calling attention to whatever point they would further, they end up calling attention only to themselves and their own jarring freakishness." Robert Hatch is less disturbed by the images, as his review in The Nation praises the film for its reconstruction of Grass' picaresque novel: "There were more than enough scenes from which to choose: the Christ child as drummer, the ghastly harvest of eels, the storm troopers waltzing to Oskar's beat, the dwarfs' picnic atop the Normandy bunker, the siege of the Danzig post office, the seduction of Maria with fizz powder. The film is a splendid spectacle, but only a sampling of the novel's three books. It is like watching a slide show of some well-remembered land, the snapshots bringing to mind more than they can show." The story structure seems to be carried away as the technique of the adult Oskar's voice-over narration from an insane asylum (though this is not clear in the film), recalling the events of his childhood, is abandoned. Though this awkwardness is merely a problem of the adaptation process it does little to diminish the effectiveness of the screen presentation, which has a style rooted in Expressionism, and is powerful and original.